is not working. Gives no AlbumThumb, even, if there is one on musicbrainz. One request: is it possible to have a parameter to tell the widget to only display 1 episode if multiple exist for the same TV show? 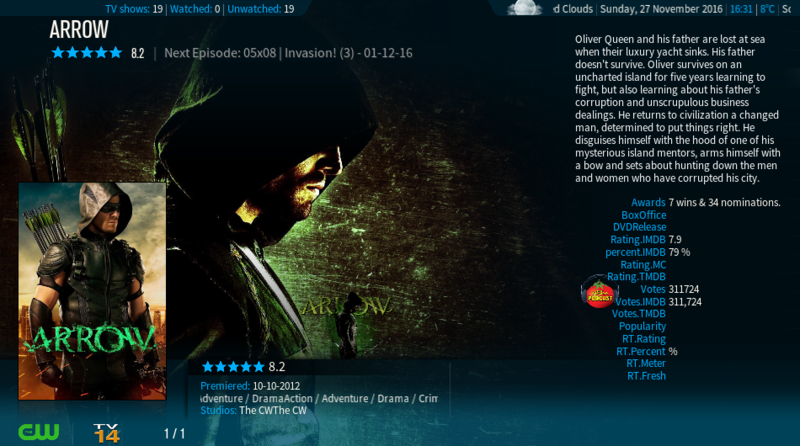 Usecase: adding new TV show with multiple episodes, completely fills out the widget with that TV show... It would look nicer if only one entry was there, for example just the first unwatched..
1) The widgets indeed have their own caching to make sure the database isn't hammered constantly with requests. With the reload parameter you can make sure that kodi refreshes the container and that the latest info is pulled from the kodi DB (cache ignored). For the "media" widgets it's recommended that you use both the widgetreload and widgetreload2 propety to make sure all scenarios are caught. widgetreload is used for all video library items and widgetreload2 just changes every 10 minutes. 2) As for your request: In the addon settings for the Skin helper Widgets you'll notice a setting "group episodes" which is what you need. Did you try setting the ID to $INFO[Container(201).Listitem.Property(widget)] ? 1) You don't need that additional radio helper script, that logic is already in Skinhelper (for a long time already) and it will only add some more overhead and performance loss if you use them both. 4) Please check if Player.Art.Thumb is working, I will look into the AlbumArt property, might be that it's only set for library content. If that's the case I'll fix it. - With Kodi running, open your browser and type the url for the artwork lookup. To flush the cache, delete simplecache.db in userdata\Database when Kodi is closed. OK, thx. Will test it, when the new version is out. I'm using the streaming helper script, beacause it splits the streaming info into $Artist, $Track and $Album. (2016-11-27, 14:17)Solo0815 Wrote: [ -> ] OK, thx. Will test it, when the new version is out. What InfoLables do I have to use? MusicPlayer.Title, .Artist and .Album are not working. Does skinhelper have special InfoLabels? (2016-11-27, 13:49)marcelveldt Wrote: [ -> ] Did you try setting the ID to $INFO[Container(201).Listitem.Property(widget)] ? I set in Settings.xml this code for label and dont have info back. Are SkinHelper.ListItem.Rating.IMDB and SkinHelper.ListItem.Votes.IMDB meant to work for tvshows and episodes? I get nothing when trying to use it in DialogVideoInfo unless it's a movie. Also, SkinHelper.ListItem.Premiered.formatted displays the date as "27 Nov 2016" or something similar. Is it supposed to display the localized variation chosen in skin settings? For example, I've chosen "11-27-2016" for my preferred format and it ignores the setting. (2016-11-27, 17:01)wheatfield Wrote: [ -> ] Are SkinHelper.ListItem.Rating.IMDB and SkinHelper.ListItem.Votes.IMDB meant to work for tvshows and episodes? I get nothing when trying to use it in DialogVideoInfo unless it's a movie. Do you have take a look for extrafanarts not working with tv shows and movies ? Only working with music. the genre artwork function is also broken for the webservice. (2016-11-21, 21:34)Rantanplan-1 Wrote: [ -> ] Shouldnt this work? did try to set the random Fanart delay by onload and manualy with "Set.Numeric" got always a black BG (No Images). Yes that should work, are you using repo version of the script on the newer script.skin.helper.backgrounds addon ? Problem solved after a "refresh" to the same version Number, so works now ..
(2016-11-27, 16:00)Solo0815 Wrote: [ -> ] What InfoLables do I have to use? MusicPlayer.Title, .Artist and .Album are not working. Does skinhelper have special InfoLabels? All properties as mentioned in the "listitem" section and the normal kodi listitem properties are available for the Player too. (2016-11-27, 17:38)Guilouz Wrote: [ -> ] Do you have take a look for extrafanarts not working with tv shows and movies ? Only working with music. Also you can remove the other visibility conditions as the script can also provide extrafanrt for plugins and homescreen widgets.